on October 29, 2018, 9:40 a.m. The UAE is a melting pot of cultures and a land of diverse celebration. From festivals to sports championships, concerts to shopping events, there is something for everyone. Islamic and local holidays like Eid Al Fitr (76%), Eid Al Adha (72%), National Day (59%) and Hijri New Year (48%) are much more popular among the UAE residents as compared to western holidays like Gregorian New Year (59%) and Christmas (34%). Despite Halloween being a western concept, 14% respondents in the UAE stated celebrating this festival, more so in Dubai and Abu Dhabi. While Halloween is most popular among western expats, it appears to be celebrated among all nationality groups, being least popular though among Arab expats. Interestingly, a higher number of females enjoy the spooky festival, with close to 20% of them participating in Halloween celebrations as compared to 12% of men doing the same. Of those who celebrate Halloween, 42% said they enjoy the festival by going out to Halloween- themed places, events or parties. This is a popular practice in Dubai and also with the single population. Of the Halloween- themed places and events frequented by revellers, 3 in 5 people prefer attending private Halloween events/parties to get into the spooky mood, with a higher number of females reporting that. Close to half also flock malls and public events. 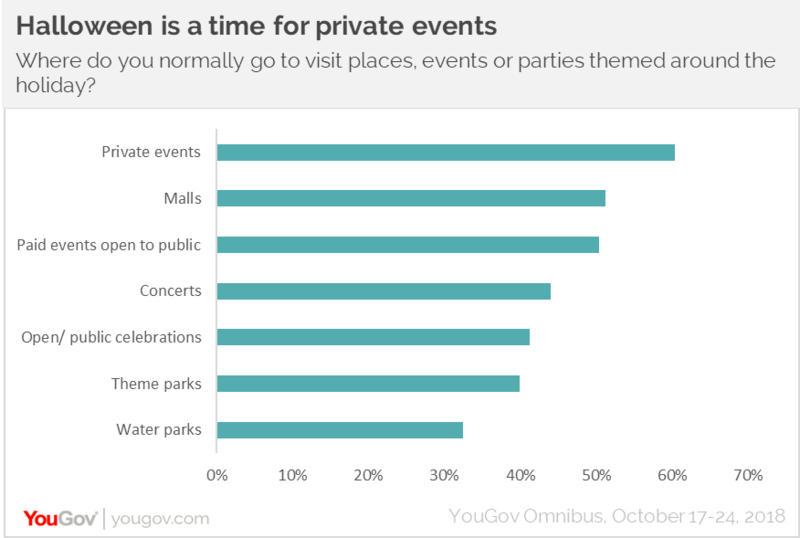 Theme parks and water parks are the least preferred venues for Halloween celebrations. 1 in 3 people either spend time with family/ friends or go out for a meal with them for a fun Halloween experience. Evidently, singles prefer going out to events/ theme parks and married (with children) like to spend time with family. A quarter (25%) also indicated throwing a party/dinner at home or traveling within the UAE around this time to get into the festive mood. Trick or treat: Where is the money going? Halloween is synonymous with costumes, candies and theme parties. The biggest expense for Halloween celebrations is for organising a party (AED 288 on average), followed by buying tickets to events or parties (AED 235 on average) and the least spending goes on costumes (AED 157). Decorations and candies/ treats account to close to AED 175 each. On average people in the UAE spend AED 226 for celebrations, with Emiratis and Arab expats spending the most compared to all other expats. The spending differs across genders as well. Although women are the more active participants in the celebration, they shell out less money than their male counterparts. A third of men indicated splurging between 100-299 AED while an equal number of women mentioned spending under 49 AED during the festival. Data collected online by YouGov Omnibus among 1,007 respondents in the UAE between 17th and 24th October 2018 using YouGov’s panel of over 6 million people worldwide. Data is representative of the adult online population in both countries.